It's been almost seven years since the Obama family stepped into the national spotlight. That number becomes even more apparent when you realize how quickly the president's two daughters have changed from chubby-cheeked kids into awkwardly adorable teens just trying to figure out their place in the world. At a White House prayer breakfast on Tuesday, Obama admitted he's emotional about Sasha and Malia and how quickly they're growing up, and he quipped that the thought of it sometimes turns him into a wreck. "I start tearing up in the middle of the day, and I can’t explain it," said Obama. "Why am I so sad?" The Hill reported that the president paused before adding, "They're leaving me." Cue the sound of breaking hearts and gross sobbing nationwide. The president has every right to be a little misty over the thought, of course. 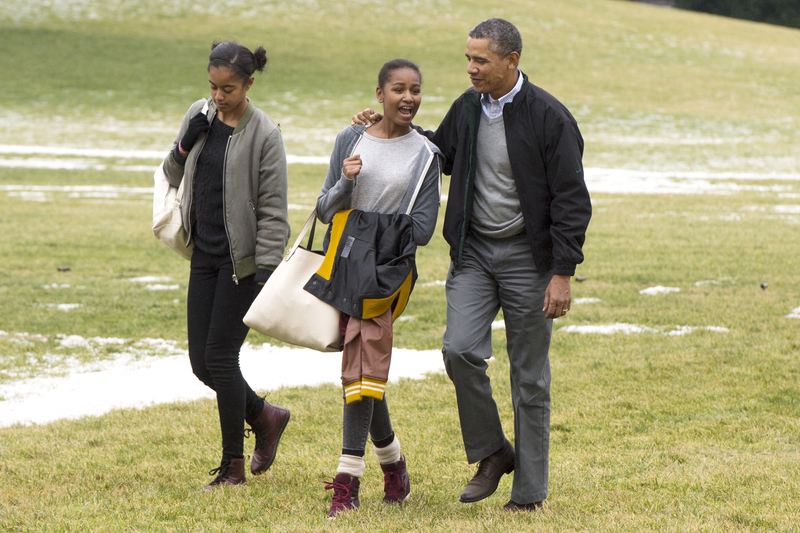 According to The Hill and reports by The Washington Post, 16-year-old Malia and her mother, Michelle, have spent the last year touring Stanford and the University of California, Berkeley on the West Coast, as well as the East Coast's Columbia University, Barnard College, and New York University. The bright student, who plays tennis and wants to become a filmmaker someday, will no doubt have her pick of the litter, if predictions by a spokesperson from the National Association for College Admission Counseling in Arlington, Virginia, are correct. "Given the educational attainment of her parents, which is exceptional in itself, I can only assume she is going to be a bright and well-qualified student," said David Hawkins in an interview with the Chicago Tribune this past December. "When you add to that who she is, all of that makes her a desirable candidate for pretty much any college." Malia isn't the only First Daughter to make the headlines, though. Sister Sasha has also been gracing the public stage lately — and she's doing it in style. Despite barbed commentary from a disgruntled former GOP staffer (who called both Sasha and her sister's Thanksgiving outfits "bar-ready" and accused them of being "classless"), the 13-year-old played it cool, mashing a plethora of fun, age-appropriate items including cable-knit stockings, ankle-boots, and a sweet skater-dress. The staffer also criticized the girls' eye rolls and smirks at their father's remarks, calling them "awful" teens — but come on: Who hasn't been embarrassed by a parent before (much less in front of a national audience of millions)? Sasha and Malia's most recent ventures have also included a pop over to the Library of Congress to view the original manuscript of Abraham Lincoln's second inaugural address, and a trip down to Selma, Alabama to participate in the 50th anniversary commemoration of the 1965 Bloody Sunday march. For a pair of nationally-recognized teens, Sasha and Malia seem to be going about a pretty normal, scholastically solid adolescence, thanks to their parents' insistence. Both of the president's daughters have proved themselves to be generous, good-spirited young women as well. Back in January, the girls joined their father and mother at the DC Central Kitchen, a charity organization which offers free meal distribution and culinary training to low-income and unemployed men and women, to wrap burritos for one of the center's daily meals. In the past, the two have also spent time at other charitable events, including the annual Christmas in Washington performance (the proceeds of which go directly to the Children's National Medical Center), handing out Thanksgiving meals to the homeless at community based non-profit organization Martha's Table, and participating in various service activities at the Boys and Girls Club of America. It's a wonder they ever have time for homework. Malia and Sasha Obama were mere tweens when their father first took his place in the White House, but in spite of all the media firestorms and public appearances, the two live a relatively low-key lifestyle, insisted mother Michelle in a visit with Live With Kelly and Michael during the White House Easter Egg Roll on Monday. "They're not influential," laughed the First Lady, maintaining that her daughters probably shouldn't be on the list of Time's 25 Most Influential Teenagers of 2014. "They just live here. They have done nothing to gain any influence." But, she added, she's still pretty proud of them. "They get their stuff done," she said of the "self-motivated" duo. "They handle their business." ...Okay, so the Secret Service did have to step in once or twice — most notably to teach 16-year-old Malia how to drive — but who's counting?